Rose City Veterinary Hospital will host its 100th birthday celebration Sunday, July 24, noon-4, at the clinic in SE Portland. The festivities, including refreshments, games, prizes, and more, will provide fun for the whole family, and all are invited to attend. This centennial is not only a landmark for Portland’s first veterinary hospital, but honors an interesting time in Portland’s history. Before the turn of the century, Portland was a frontier town populated by fewer than fifty thousand souls. Thanks to being home to the junction of the Willamette and Columbia Rivers, however, its prominence and population grew rapidly. By 1910, the population had exploded to more than 200,000 residents. 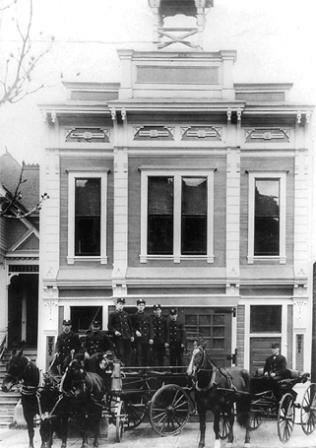 Among the businesses beginning to bloom at this time was Rose City Veterinary Hospital, the first veterinary hospital in the city, opened in 1911 by San Francisco Veterinary College graduate Dr. Gus Huthman. Of the many businesses established on the eastside, Rose City is one of the few still flourishing a century later. The former Portland Fire Department Station at SE 7th and GrandDr. Huthman’s practice was originally situated in the former Portland Fire Department Station at SE 7th and Grand. Built for the fire department in 1891, the large doors for horses and fire wagons made it ideal for an equine veterinary practice. As the city grew, so did its demands. Huthman attended to the needs and care of the many horses it took to support the thriving young metropolis, but the veterinary hospital was much different than those we know today. Initially, demand for companion animal care was overshadowed by the need to keep working animals healthy; medical attention was generally not considered a necessity for family pets. The advent of the automobile, however, dramatically changed the focus of veterinary care, and of Dr. Huthman’s practice. As cars and trucks became the preferred method of transportation, horses within the city limits began to diminish. At the same time, growing neighborhoods turned the cityscape into a family environment, and more urban residents meant more pet owners. A shrewd businessman as well as an accomplished veterinarian, Huthman changed his practice to meet peoples’ changing needs by offering services for household pets. Huthman moved in this new direction with enthusiasm and dedication, even converting his1923 Studebaker truck into a pet ambulance. Dr. Huthman was proud to be a Portlander and supported his community wherever possible. He was a member of the Elks and the Masons, as well as director of the Eastside Commercial Club. His sense of civic responsibility and philanthropy was illustrated by an Oregonian article published April 28, 1906, which highlighted Huthman as one of Portland’s donors to the San Francisco earthquake and fire relief fund. In addition to his civic support, the doctor also made significant contributions to the veterinary community. In 1936 he became one of seven founding members of the Portland Veterinary Medical Association (PVMA), which to this day remains dedicated to veterinary excellence in Portland. The Rose FestivalIn the 1950s, the practice moved to its current location at SE 8th and Powell, at the foot of the Ross Island Bridge. Dr. Craig Quirk, a 1990 graduate of Oregon State University’s College of Veterinary Medicine, purchased the practice in 1996. As a past president of the PVMA, Quirk is keenly conscious of promoting the vision of excellence established by Dr. Huthman a hundred years ago. There is no longer a pet ambulance at Rose City, but a complete renovation in 2005 made the hospital a model of a modern veterinary care. 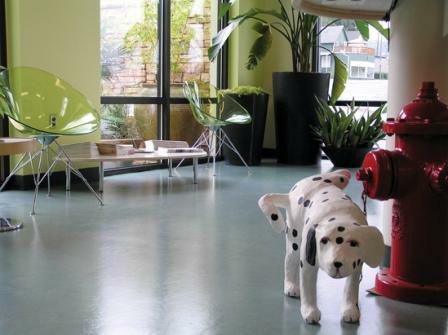 Sporting a chic urban design featuring Quirk’s whimsical collection of animal art, the practice is one of the newest veterinary hospitals in Portland even while being its oldest. The client-friendly lobby, with complementary coffee and fresh-baked cookies, is more than window dressing: the hospital is appointed with state-of-the-art surgical and therapeutic lasers, digital radiography, ultrasound, full blood analysis and a host of other modalities that underscore how far veterinary medicine has come since the hospital’s founding in 1911. Rose City has been commemorating its 100 years in business by featuring dogs from 1911-2011 on its facebook page (www.facebook.com/rosecityvet). To learn more about the hospital or the celebration, visit RoseCityVet.com. Posted in Pet Biz, Events and tagged with Events, Veterinary, Celebration.